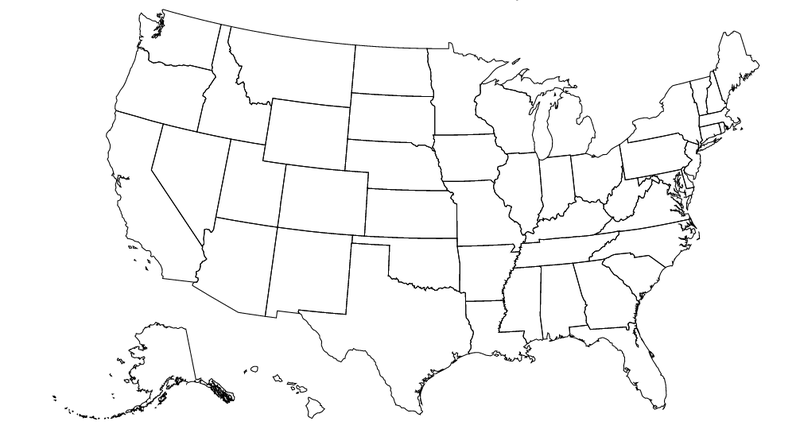 The actual United States, colored by electoral results. Red is a Trump win. 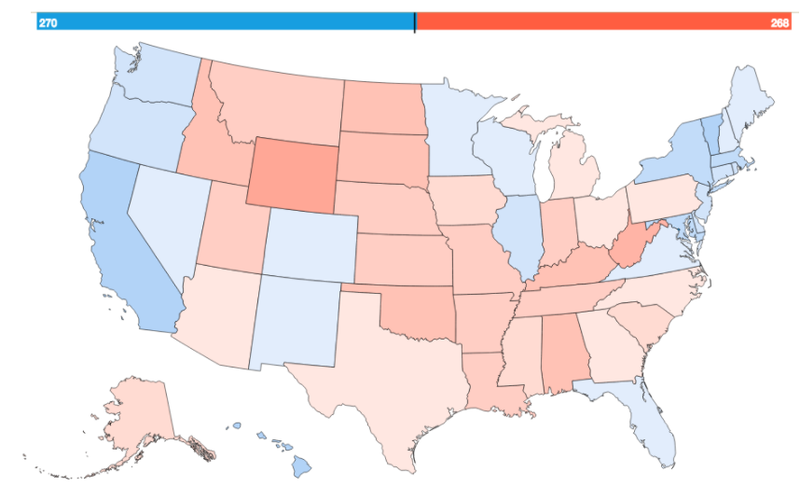 Blue is a Clinton win. The bolder the color the bigger the win. Why am I looking at silly maps, you might say. What difference could it possibly make? Well, look below where I’ve added some familiar colors. That’s right. If the Wisconsin border were just a bit farther south and the Florida border a bit farther east, then Hillary Clinton would have won the presidency. In fact, it doesn’t even require moving the entire Wisconsin-Illinois border further south, but just moving Lake County, Illinois, four miles north of Northwestern University, into Wisconsin to have the same effect! All of these facts I discovered with a small tool for exploring the Electoral College I call Redraw the States. 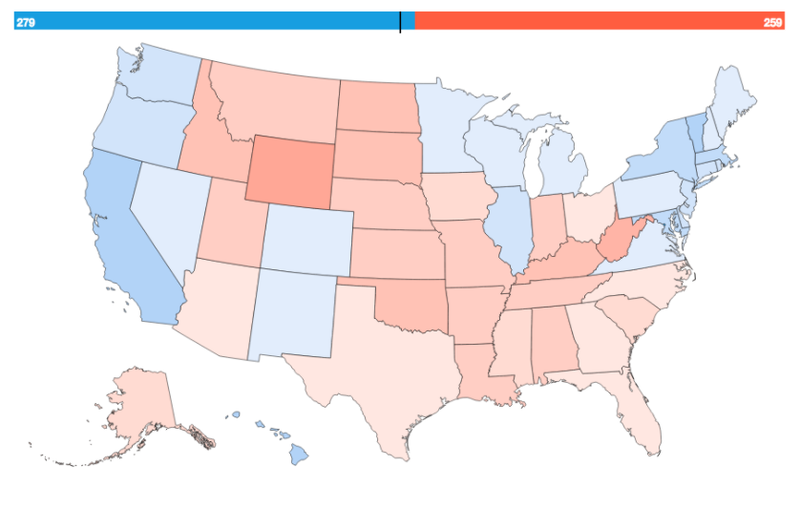 Yup, Hillary wins with this map. “electors” to the Electoral College. This group of people then actually elects the president according to the rules of (mostly) the Twelfth Amendment to the Constitution. 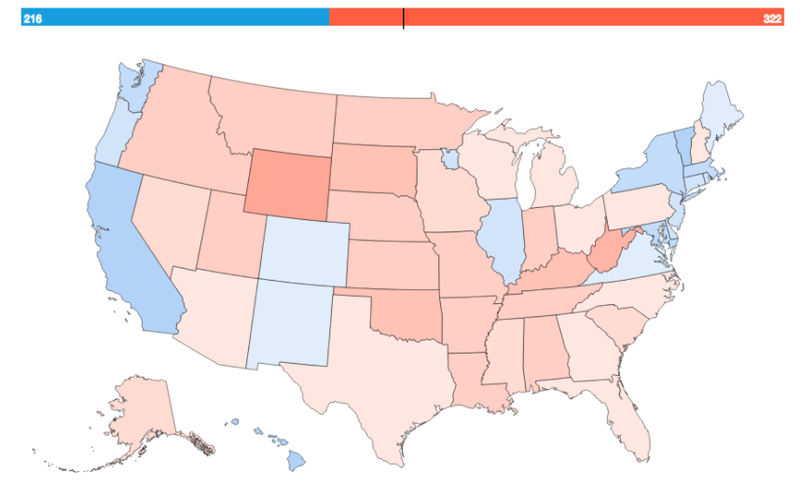 Essentially, the candidate with the majority of electoral votes wins. The number of electors a state gets is equal to the number of representatives it has in the House of Representatives plus the number of senators it has, which is always two. Moreover, the District of Columbia gets three votes, in accordance with the Twenty-Third Amendment. All in all, that means that a candidate needs to win 270 electoral votes in order to be elected president. Donald Trump only got 45.9% of the vote in Utah, he still gets all six of their electoral votes. And even though Donald Trump only beat Hillary Clinton by 10,000 or so votes in Michigan, he will receive all 16 of Michigan’s electoral votes. Yeah, she wins with this map too. Do you see what’s different? 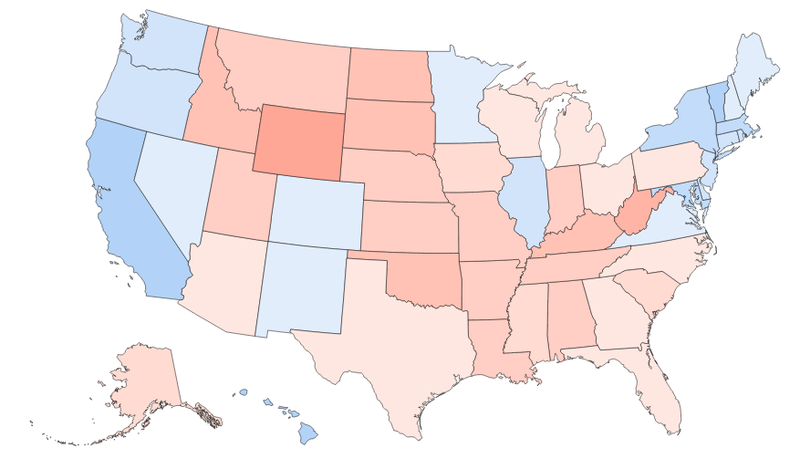 This brings up an important question: How stable are the results of the Electoral College if we just slightly change the borders of various states. Why would this matter? Well, if Hillary Clinton had just gotten 10,000 more votes in Michigan, then she would get all of the states 16 votes instead of Trump. Or if she’d gotten another 15,000 votes in Wisconsin, she would be granted all 10 of that state’s electors. So if we can move some nearby counties dominated by Democrats into Wisconsin and Michigan, and on the other and, move some counties dominated by Republicans out of Florida, then Secretary Clinton would have picked up those states. of allocating congressmen would have given Pennsylvania one of Texas’s representatives. protection, but one of capriciousness. Unlike the gerrymandering that plagues congressional districts, this sort of “cracking” of Democratic support is due to historical accident. Some would argue that this makes it more palatable, but I would argue that it undermines faith in the “fairness,” and thus the legitimacy, of the system. Building city-states, like the “State of Minneapolis” and the “States of Seattle and Portland” give Trump an even larger advantage. Practical democracy is, in the end, much less about voters expressing policy preferences than leaders obtaining consent to govern. And in any system where arbitrary groups of voters are collectively given a single vote, there will always be corner cases where one candidate can best her opponent by 2.2 million votes and still lose. As long as we are directly electing the president, let’s finally abolish the Electoral College and use the popular vote, so that moving a few thousand square miles of territory around won’t make the difference between outcomes. Farmer by upbringing. Mathematician by training. Data scientist by profession. Yeller at clouds.